When PBS MediaShift began planning the bi-coastal “Hack the Gender Gap” event with WVU’s Reed College of Media, we knew this would be a complex undertaking. A women’s panel at Google HQ in Mountain View, Calif. with top tech and media people in attendance? Check. 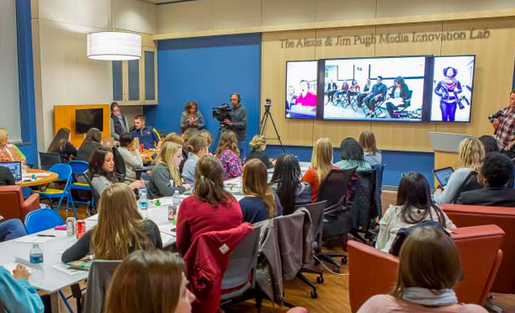 A women’s hackathon on wearables at WVU focused on female college students, faculty and pros? Check. But could we bring them together? With the magic of Google Hangouts on Air, we were able to have a panel of top women discuss current issues as well as how they had succeeded, with students at WVU watching, being inspired and asking questions. The entire weekend event, from Oct. 24 to 26, was a huge success not only because of the great participation and smart ideas at the Hackathon — but because it showed just how powerful women can be when given the space and time to show their skills. We’ve rounded up a collection of photos, the live-stream of the panel, as well as coverage on PBS MediaShift and beyond. Plus, there’s a great Storify highlighting the top moments on the #GenderGap hashtag on Twitter during the weekend. If we missed any good links of coverage, please add them to the comments. Emily Corio from WVU was one of the mentor/facilitators at the Hackathon, and she put together this Storify to sum up the symposium and Hackathon in one place.